Fantastic 6th floor views of Yampa Valley. Lovely one bedroom one bath condo, 1/2 share, 26 weeks each year, that's 2 weeks together every month. Mogul floorplan. Recent upgrades include carpet, flat screen TV, art, decor, lighting, queen sofa bed and love seat. 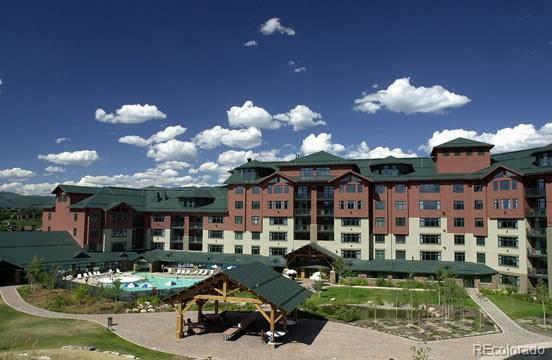 Steamboat Grand fractional ownership allows owners YEAR ROUND use of all the amenities at the Grand. Amenities include seasonal ski storage and ski valet in Gondola Square, covered parking, pool, hot tubs, fitness center, saunas, and owner's lounges. Also, owners get discounts at 3 on-site dining locations and the full service day spa. Luxury at a fractional of the cost. Excellent location across from Gondola square, easy walk to ski. First Tracks ski access. RCI property exchange. Conventional financing available.